Planning – The Planning stage of the project is when Public Works and Engineering Department and professional engineers study areas of the City that have been identified by the Department’s engineering methodologies for possible improvements. Engineers then develop alternative solutions for pavement, mobility, and drainage improvements. Community input is necessary to ensure that any project being considered for future funding reflects the context of the community. CIP Townhalls – This is the City's annual Capital Improvement Plan (CIP) meetings held each spring. At this meeting, PWE will showcase its proposed CIP projects for the year and the need areas that were studied for potential projects in future CIPs. Design – Once a project has been approved for funding in the City’s Capital Improvement Program, the project will proceed into preliminary and final design. Prior to moving into final design, a community meeting will be held which will allow the Department, the design engineers and the community to discuss the project components and make modifications, if required and economically feasible, before the design is finalized. This is a good time for the community to get more detailed information about the actual design of the project. Construction – The Construction Phase meeting will occur at the Councilmember's request either immediately prior to the start of construction, or shortly after construction has started. This is the community's chance to review the construction plans and work directly with residents and businesses about construction-related impacts and schedules. Along South Blvd. and Westpark Dr.
S-000900-0156 (108-Inch) 54-Inch Water Line: Vickery Dr. from Aeropark Dr. to World Houston Pkwy. 60 Inch Water Line Along Glen Valley Dr, Santa Elena St, and Colgate St, from Rockhill St, to Dixie Dr.
Shepherd to Spur - N-100020 4 segments - Weslayan to Almeda. City of Houston has responsibility for two of the four segments. 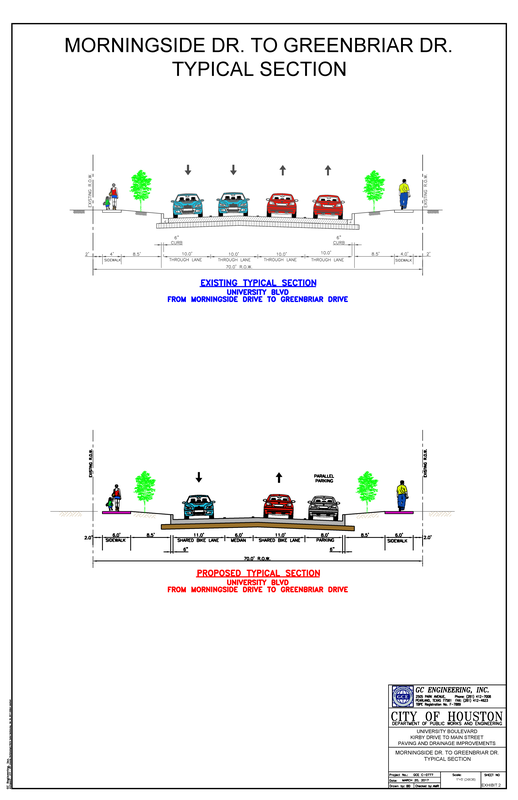 Fondren Reconstruction (N-100008) Creekbend Drive to S. Braeswood Blvd.